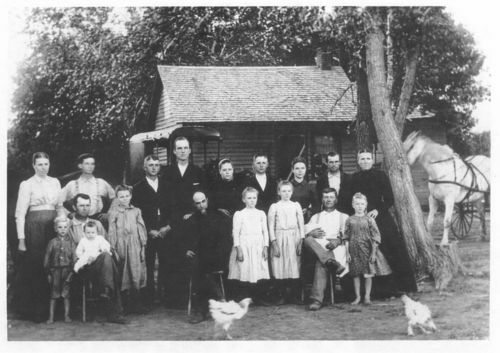 A photograph of the Reuben J. Heatwole and Susanna Heatwole Brunk Cooprider families taken in Groveland Township, McPherson County, Kansas. Both families were members of the Mennonite Church. They are identified as (left to right) front row: George W. Cooprider, Walter Cooprider holding Henry F. Cooprider, Nettie M. Cooprider Hostetler, Reuben J. Heatwole (with beard), Ethel Cooprider Erb, Florence Cooprider Friessen, John A. Cooprider holding Ruth Cooprider Zook, and Grace Cooper Diller, back row: Minnie Brunk Cooprider, Frank Stutzman (hired hand), Henry Heatwole, George R. Brunk, Susanna Heatwole Yoder, Charles W. Cooprider, Lucy Cooprider Ely, Charles Yoder, and Henrietta Brunk Cooprider. Susanna Brunk Cooprider was present but remained in the house because she thought it was vain to be photographed.